A common reason we hear for people not sticking to a vegan diet is the cost. Eating healthy can be more expensive in the short-term, but the costs balance out in the long run. Before giving up on your hopes for a vegan diet, consider trying some of the proven methods that can be used to find cheap store-bought vegan foods. Thanks to technology, the ability to find cheap vegan food is now easier than ever. Eating vegan often involves cutting out processed foods. When shopping for store-bought vegan foods, you’ll end up discovering that you’re purchasing more fruits, vegetables, and niche foods that tend to be a bit pricier than what you were used to eating beforehand. Unfortunately, eating clean or healthy in America can be expensive, which is one of the reasons health problems such as obesity are growing into epidemics. The British Medical Journal conducted a study that found it could cost upwards of $550 more per year to eat healthily. When considering a vegan diet, you should also consider the fact that you are investing in your long-term health. Unhealthy eating can contribute to a host of health problems down the road, such as diabetes, high blood pressure, and high cholesterol. These can all increase the risks of other serious complications like heart disease and stroke. Treating these issues, however, can lead to very expensive healthcare costs. Dr. Dariush Mozaffarian, associate professor at Harvard Medical School and Harvard School of Public Health, said that the per-year price difference of a healthy diet is relatively small in comparison to the economic implications of chronic diseases caused by someone’s diet and that a healthy diet reduced the risk of disease. As Food Tank co-founder Ellen Gustafson said in this post, there are hidden costs that you don’t see when ordering your favorite fast food meal. Once considering the long-term health implications, it may be easier to accept that switching to store-bought vegan foods could be an effective financial move. But if the year-to-year costs still seem a little daunting, consider these tips for finding cheap vegan food. When in search of store-bought vegan food, consider these strategies to help with your search. By eating a vegan diet, you’ll end up eating clean, whole foods. You don’t necessarily need to focus on whether or not a food is organic, dye-free, or GMO-free. Research has shown that a plant-based diet is sustainable, and is an effective way to improve your carbon footprint. It’s easy to be overwhelmed by terms like “Fair Trade.” This will also drive up your cost as a result. Focus on the big picture, sticking your vegan diet, and you’ll be okay. That’s not to say you can’t spend some money on organic products, but have a plan when you walk into the store. For example, you can view this list from the Environmental Working Group, which indicates which fruits and vegetables are more likely to exposed to higher pesticide residues. You may want to lean toward purchasing berries, spinach, and lettuce that is organic. On the other hand, anything with a thick rind, such as watermelon and pineapple, may not need to be organic. Planning ahead of time will help you stick to your budget and prevent you from being caught off guard by good marketing. Similarly, write your meals out beforehand. You’ll end up buying only what you need, which will reduce the costs of shopping on a vegan diet. Furthermore, you can search for recipes that use similar ingredients. Say you need half an apple for a dish on Monday. Find a Tuesday or Wednesday dish that uses apple so that you can cut down on waste. Knowing what vegan foods to buy, and in what quantities, will be an effective money-saving tool. Even if you save $2 a week, you’ll end up saving more than $100 a year. The money saved when vegan grocery shopping may not seem like much at the moment, but it will add up over time. Just because you are starting a vegan diet does not mean you have to limit what you eat! There are many meat, egg, and dairy substitutes that will make you forget your traditional diet of the past. Limiting your options could cause you to drive up your costs. Consider all foods that are vegan-friendly. Don’t shy away from trying something new, especially if you find that it’s the cheapest product. A perfect example is frozen fruit versus fresh fruit. In certain circumstances, you’ll want fresh fruit for a meal or snack. But in other circumstances, frozen fruit will suffice just the same, but for a reduced cost. There’s nothing wrong with buying frozen fruit if it will adequately suffice in a meal. Don’t be afraid to think outside of the box. Where Can You Buy Vegan Food? If you want to commit to making a vegan diet work, you’ll first have to know the answer to the question, “Where can you buy vegan food?” As mentioned above, planning ahead of time is a great way to reduce costs. Knowing where to go vegan grocery shopping and what vegan foods to buy can save you both time and money. No matter if you plan to head to your local supermarket or go vegan food shopping online, you should be able to find all of the store-bought vegan foods you need. It’s possible to go vegan grocery shopping at any common grocery store or supermarket. Over the past few years, many of these stores have expanded sections of the store for those that are health-conscious. It’s now easier than ever for those with dietary restrictions, such as those who are vegan or gluten-free, to head toward a certain aisle to find all of the foods that will meet their dietary preferences. When you get to the grocery store, you may be surprised at how many items in the store will fit into your diet. Starting a vegan diet may seem like a daunting task, but there’s really only a few foods and beverages that you’re cutting out. Researching vegan diets beforehand will give you a better idea of what you should and should not look for while in the store. Of course, you can always ask for help from an employee if you need it. Also remember that the more familiar you become with shopping vegan in your local grocery store, the easier it will become. Once you find something, you’ll know exactly where it is when you visit in the future. When first starting out, don’t feel as though you need to jump on-board 110%. You could quickly get burnt out trying to adjust your habits and taste buds to a completely new diet. Don’t be afraid to grab a non-vegan item, knowing that you are going to phase it out of your diet in the coming weeks. When converting to a vegan diet, it can be more beneficial to make adjustments slowly. Many have found that it’s easier to look for cheap vegan food online. Using a vegan supermarket online has pros and cons compared to traditional vegan grocery shopping. 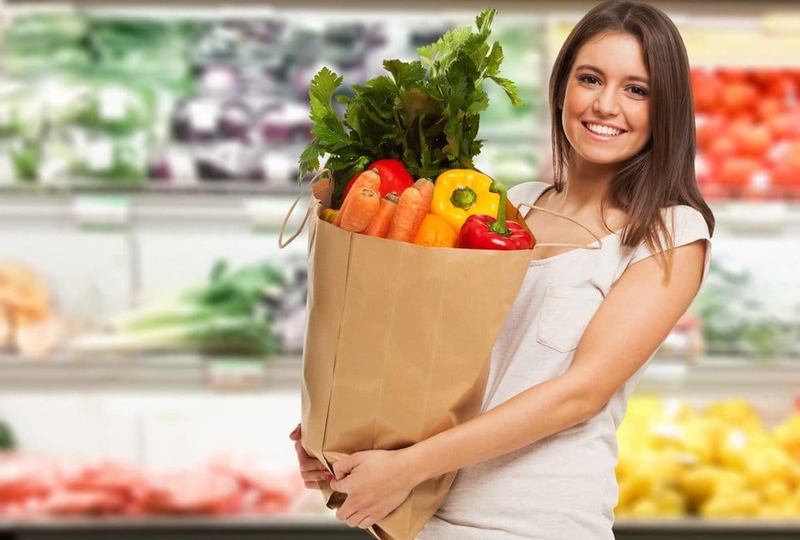 Vegan food shopping online provides the extra convenience of not having to deal with the hassle of going to a grocery store, dealing with crowds, and handling heavy groceries. Instead, vegan groceries are delivered to your doorstep. However, you also don’t have the ability to look at things such as produce before purchasing. Fortunately, many vegan supermarkets online are very reputable and have good customer service, alleviating these issues if they ever arise. We recommend making sure you know which brands you prefer before looking for cheap vegan food online. Start with your local supermarket, and try the various vegan brands they have to offer. Once you know which brands you prefer, it’ll be easier to place online orders. With that being said, feel free to try the many different products found in online stores. Because they are geared specifically toward vegans, they may have a better selection of products, which could make them a more attractive option for vegan shoppers. Don’t shy away from trying something new! A company that has quickly become a popular vegan supermarket online is Amazon. In fact, Amazon’s selection has grown to the point that it can seem overwhelming at times. It’s great to know that you should be able to find your trusted vegan brands, but can also venture out and try new products at any time. Fresh vegetables can also be found in the Amazon store. To help you find cheap vegan food online, take a look at this list of vegan-friendly grocery delivery services.